Lenco earned audiophile status building high-end turntables with Swiss precision from as far back as 1946. Now Dutch-owned, the legend lives on in the Lenco L-175, a handsome glass-topped deck that brings with it some very useful modern comforts. The USB port and built-in pre-amplifier are there to ensure it will interface with any new-fangled hi-fi and it even ships with a copy of Audacity, so you can rip your records to a hard drive. At £400, it promises even more convenience than the trendy TDK ETVT20102 USB and aims to pip the longstanding favourite Pro-Ject Debut Carbon for sound quality. 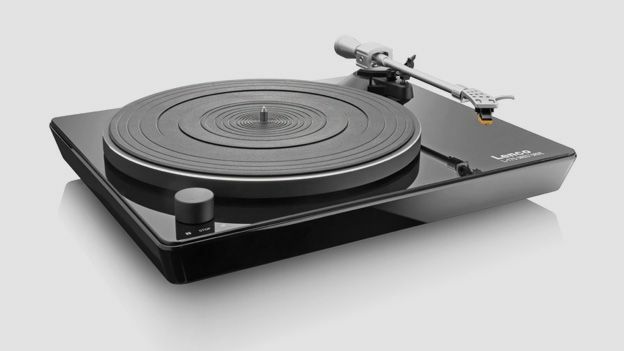 But costing £100 more than both, the Lenco L-175 needs more than black glass to prove it is the platter that matters. With its glass top and a pickup arm, platter and moving magnet headshell of aluminium, the Lenco L-175 has the look and initial feel of a premium product. It's a sleek and minimal design with the switches out of sight at the rear and an external power supply tucked out of the way. But compared with the original wooden Lenco decks that can still be found changing hands on eBay, it feels surprisingly light. That's because beneath the glass top, it's all plastic and the rear-panel controls also feel a little insubstantial, while the power transformer makes a worryingly loose connection with its socket. If the headline feature of the Lenco L-175 is its USB port allowing you to play and rip records via a Mac or PC, the built-in pre-amp is perhaps the most useful. Amplified phono inputs are becoming rare on modern amps, but this deck will boost its own moving magnet output to regular line level. Other niceties of this direct drive deck include auto-stop, so it won't spin forever when you leave the room and anti-skate to prevent your needle drifting across a dusty disc. Recording directly onto your computer is similarly satisfying, especially when you play back your high-bit rate MP3 and hear all the detail along with a gentle vinyl crackle in the background. We used a Mac and free Audacity software and encountered no problems. Depending on the quality of your vinyl, the Lenco L-175 either sounds richly detailed, with snappy percussion and clear vocals, or very crackly. It doesn't have the bass weight and bounce of a Technics SL-1210 or even the Pro-Ject Debut Carbon, so there's more emphasis on the treble, which may be a problem for deeply dusty records. But drop a freshly pressed album, like Everyday Robots by Damon Albarn, and you begin to realise why audiophiles swear by the black stuff. There's simply more depth to the music and this deck is able to reach it, well, most of it. The analogue soundstage feels larger and more open than its digital equivalent on CD. Switching from the Lenco's built-in pre-amp, to a dedicated phono stage, namely the excellent Musical Fidelity V-90LPS, brought quite dramatic improvements. Fizzing cymbals and thin basslines suddenly sounded much more full and rounded than before and the missing bass weight was restored. In other words, we wouldn't recommend relying on the inbuilt pre-amp if you have any other options. USB-equipped turntables are often disappointing because they are built to convert your vinyl rather than make it sing. While not exactly audiophile grade, the Lenco L-175 is different because it achieves the warm, welcoming sound of vinyl thanks to decent design and a good pick-up arm/cartridge combination. The built-in pre-amp has room for improvement, however, and the lightweight, rather cheap-looking build quality still leaves us longing for the wooden Lenco decks of old. Lucky for us then, that Lenco is planning to revive one of its wooden classics in the near future.